Every night a battle takes place in homes across the country. Not in every home, not with every family, but the number of parents and children enlisted in this war are growing at alarming rates. In this war, the recruits are drafted involuntarily. Parents are put on the front lines, expected to ensure that homework is not only complete but also done well. Regrettably, the ever-increasing burden of homework sometimes leads parents and children into the battlefield with little training and resources. my teacher assigns.Homework! Oh, homework! The crazy thing is research on homework shows this war is unnecessary and may not be worth the price. Crazier still, there is very little evidence to support the connection between homework and academic success. Below are three things every parent should know about homework. 1) Time spent on homework has increased dramatically over the years. 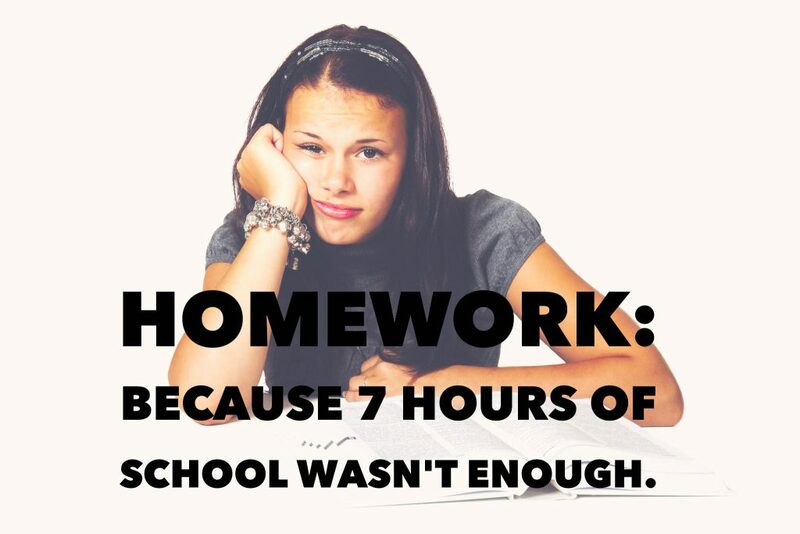 A University of Michigan 2004 national study of over 2,900 students showed the time children spend on homework has increased by 51 percent since 1981. The rise is especially noticeable in kindergarten through third grade. In an age of increased accountability and pressure to do more with less, many teachers use homework to extend the school day. There simply isn’t enough time in the day to get through all curriculum expectations. Increased demands, coupled with decreasing resources, have pushed many teachers to rely on parents to help meet unrealistic expectations. 2) Homework expectations are not always systematic. On any given night, your second-grade child may receive 45 minutes of worksheets, while the second grader in the classroom next door, could be assigned 20 minutes of reading and research for the creation of a family tree. Although some districts provide time recommendations and guidelines, most do not. Teachers are often on their own to make decisions regarding the amount of time and types of activities to assign students. Decisions are made based on a teacher’s experience, philosophy, and if provided, school and district expectations. Most homework decisions are heavily influenced by tradition. Very few college courses or professional development opportunities exist to help teachers understand and design realistic, quality homework assignments. 3) Homework does not guarantee a child’s academic success. It may come as a surprise, but there is no evidence that homework is beneficial to children. In The Case Against Homework, Sara Bennett and Nancy Kalish discuss the findings of a review of over 200 homework studies conducted by Duke University professor Harris Cooper. Society generally believes homework reinforces new learning, teaches responsibility, and prepares children for college and career. But, the research shows the negative effects outweigh the positive. Homework is similar to traffic school. A student may serve the time required, but that time does not ensure increased learning or academic success. As a parent, what are your feelings regarding the homework your children receive? Are you surprised at the lack of research to support the need for homework?